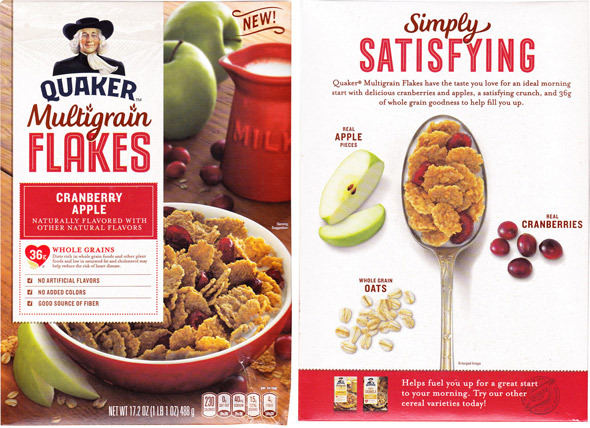 I tried two varieties of Quaker Multigrain Flakes: 1) Cranberry Apple; and 2) Honey Vanilla. I wasn't too crazy about either of them. The flakes in both cereals are very, very hearty. Instead of being crunchy, they're kind of tough, chewy and grainy. They soften slightly in milk but they never cease to be tough and grainy. There's some random oats scattered through the cereals, but they add very little in terms of taste or texture. 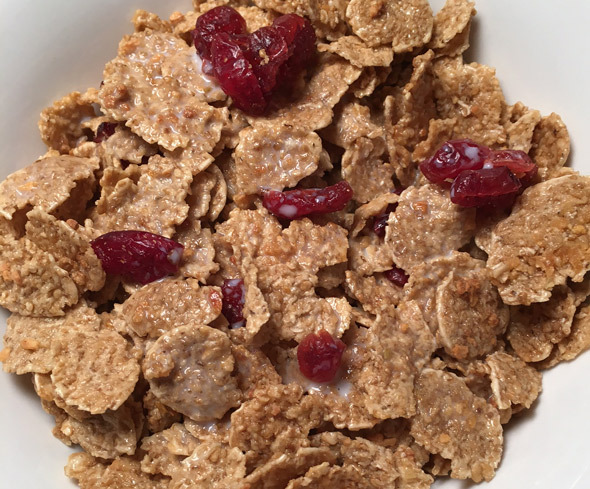 The Cranberry Apple Multigrain Flakes require a lot of work from your mouth to get through a bowl. In addition to the tougher-than-usual flakes, many of the cranberry pieces come clumped together and they are very chewy. There are no visual apple pieces in the cereal but there is some apple flavor that's similar to the flavor of apple in Quaker's Apple Cinnamon Oatmeal. Overall, the flavor of this cereal is alright, but that can't make up for the problems with texture. As for the Honey Vanilla Multigrain Flakes, there is nowhere near the amount almonds that the picture on the box would suggest. There's a distinct honey flavor that seems a bit artificial at first, but tastes more genuine the more you eat. Vanilla is there if you think about it, but it's so subtle you might not notice it. The overall flavor is fine, but far from interesting or fun. I did feel full after eating the suggested 3/4 cup serving of each cereal. 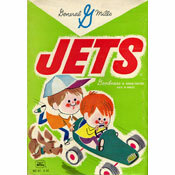 One word of caution: These cereals may appear to be very healthy options based on their names and their packaging. In truth, they are somewhat high in sugar... particularly the Cranberry Apple variety which has 15 grams of sugar per serving. In the end, my recommendation is to skip these cereals. 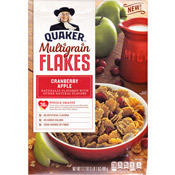 Each 3/4 cup serving of Quaker Cranberry Apple Multigrain Flakes has 230 calories, 3 grams total fat (0 saturated and 0 trans), 0 mg cholesterol, 40 mg sodium, 49 grams total carbs, 4 grams dietary fiber, 15 grams sugar and 6 grams protein. 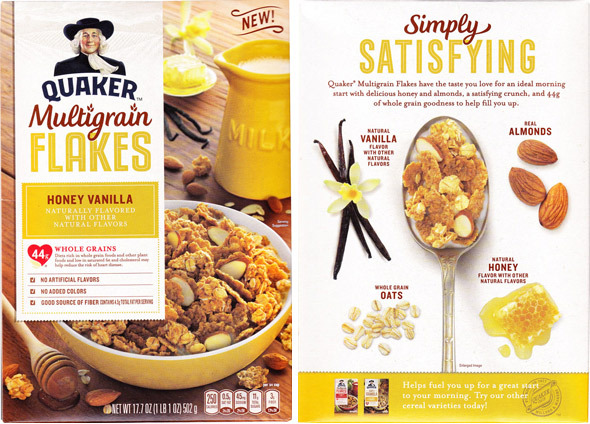 Each 3/4 cup serving of Quaker Honey Vanilla Multigrain Flakes has 250 calories, 4.5 grams total fat (0.5 saturated and 0 trans), 0 mg cholesterol, 45 mg sodium, 49 grams total carbs, 3 grams dietary fiber, 11 grams sugar and 7 grams protein. 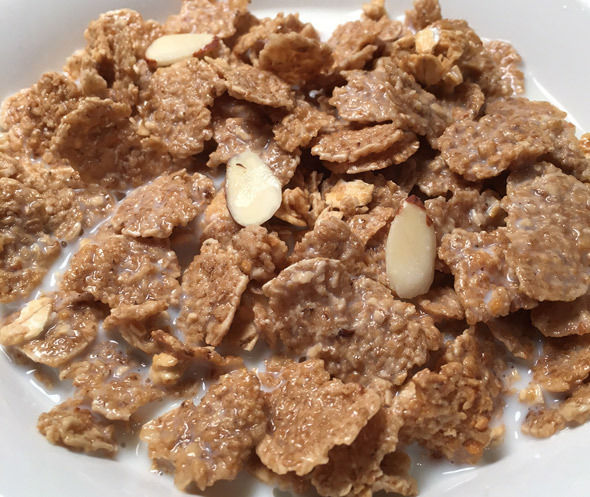 What do you think of Quaker Multigrain Flakes?